In his first season with the Steelers (1972), Harris was named the league's Rookie of the Year by both The Sporting News and United Press International. In that season he gained 1,055 yards on 188 carries, with a 5.6 yards per carry average. He also rushed for 10 touchdowns and caught four touchdown passes. He was popular with Pittsburgh's large Italian-American population: his fans dubbing themselves "Franco's Italian Army" and wore army helmets with his number on them. In his 13 professional seasons, Harris gained 12,120 yards on 2,949 carries, a 4.1 yards per carry average, and scored 91 rushing touchdowns. He caught 307 passes for 2,287 yards, a 7.4 yards per reception average, and nine receiving touchdowns. Harris's 12,120 career rushing yards rank him 12th all time in the NFL, while his 91 career rushing touchdowns rank him 10th all time tied with Jerome Bettis. Harris was chosen for nine consecutive Pro Bowls (from 1972 through 1980), and was All-Pro in 1977. Harris rushed for more than 1,000 yards in eight seasons, breaking a record set by Jim Brown. The running back tandem of Harris and Rocky Bleier combined with a strong defense to win four Super Bowls following the 1974, 1975, 1978, and 1979 seasons. On January 12, 1975 he was the Most Valuable Player of Super Bowl IX; in that game he rushed for 158 yards and a touchdown on 34 carries for a 16-6 win over the Minnesota Vikings. Harris was the first African American as well as the first Italian-American to be named Super Bowl MVP. Harris was a major contributor for the Steelers in all of their first four Super Bowl wins. His Super Bowl career totals of 101 carries for 354 yards are records and his four career rushing touchdowns are tied for the second most in Super Bowl history. Harris claims he extended his career and thus his contribution to the team's objectives (including four Super Bowl victories) by avoiding unnecessary contact. Harris was a key player in one of professional football's most famous plays, dubbed "The Immaculate Reception" by Pittsburgh sportscaster Myron Cope. In 1999, he was ranked number 83 on The Sporting News' list of the 100 Greatest Football Players. In 2006, The Heinz History Center, home of the Western Pennsylvania Sports Museum, installed a life-size figure of Harris in the grand concourse of Pittsburgh International Airport. 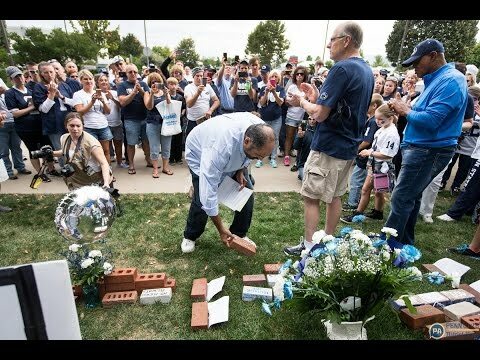 The statue is a recreation of Harris's "Immaculate Reception." He was inducted into the New Jersey Hall of Fame in 2011. 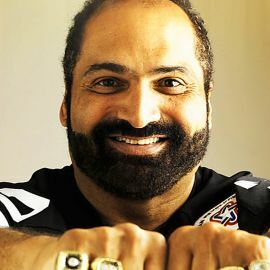 He's a Penn State football hero and a Pittsburgh Steelers legend, and if you think Franco Harris has a soft spot for the University of Pittsburgh, you'd be right.